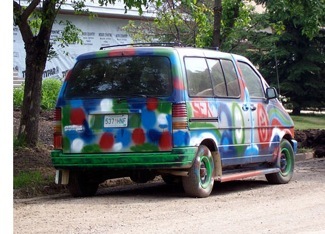 Each year sometimes as early as May some oddly painted vehicles are spotted on the streets of Tisdale. This year's crop began to show up in earlier June. Four are shown on this page but there were others that we just did not see and have a chance to photograph and one, an aging van does not appear to be operational and has taken up residence on the RECPlex parking lot. Today is graduation day in Tisdale and even this morning we were seeing couples decked out in their graduation outfits on the streets and in businesses downtown. High school graduation is a remarkable rite of passage. It not only recognises the individuals completion of high school but Canadian high school graduates are usually eighteen years old and that is when they are no longer considered minors but assume their role as responsible citizens in our society. The challenges facing each years graduating class have some similarities from year to year but the economical and social environment that each year's graduation occurs very much colours the outlook of the students and how they and their parents perceive the world into which the graduate is emerging. In 1962 when I graduated high school there certainly wasn't enough money around to buy and paint up a car just for that event. It was tough enough getting some clothes together for the occasion but otherwise the sky was the limit. In 1962 it seemed that anything, absolutely anything was possible. The outlook of people in the sixties was remarkably detached from the limited amount of money we had to spend at the time as individuals. That year Saskatchewan had moved to universal medical care for everyone, the Beatles were singing stupid songs and the United States was wading into a war in Southeast Asia. Only months after graduation the world was faced with Thermal Nuclear War as the United States confronted the Soviet Union over the locating of missiles in Cuba. But in the minds of my contemporaries getting a job was not at the top of the list. In more than forty years from now how would we some up the economic, social and political environment of 2010. We are to close right now to really know and understand what the graduates of 2010 are going to face in this coming year or the next four decades. But let's just consider for a minute some of the things that are already on the table. This is a highly technological age and that is not going to change, technology be it cell phones and computers or whatever are here to stay. Today's graduates are leaving high school when the province in which they live is on a bit of boom both in growth and in financial prospects. Definitely agriculture is a sunset industry but the horizon seems full of opportunity. 2010 lacks the artistic exuberance of other eras but there is a feeling of expansion and positiveness in the air. These are not glum times. I wish the graduates of 2010 the very best. May they advance their post secondary education and find happiness and meaning in their lives.